Osteoporosis is a nasty condition characterized by weak and brittle bones often leading to devastating bone fractures and other injuries. Unfortunately, millions of people worldwide have been diagnosed with osteoporosis. Contrary to popular belief, out bones are dynamic organs that undergo constant remodeling consisting of bone resorption and renewal. However, once bone resorption rates outpace bone renewal, bone densities decrease, which puts bones at risk of fractures. 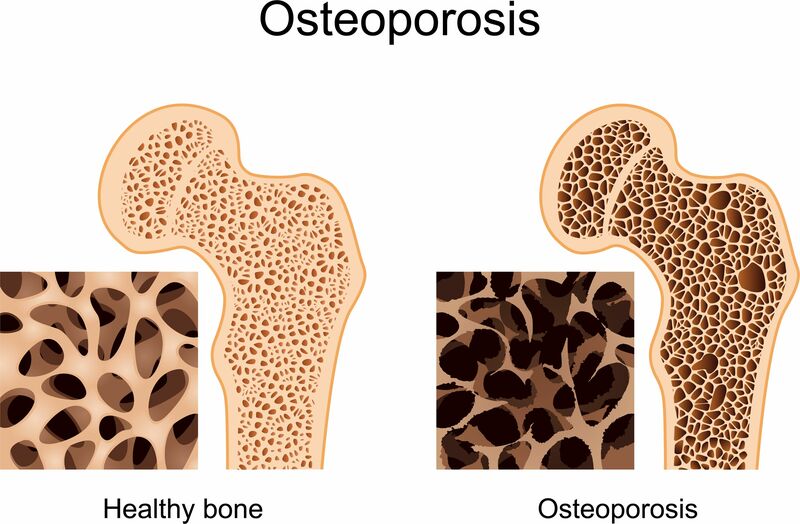 Medical researchers are would like to find new ways to not only discourage bone resorption, but generate new bone material to replace demineralized bone. Ideally, therapies would rejuvenate bone growth so that it the bone reverts back to its original density levels. Now a promising strategy to accomplish this goal is relies on stem cell therapy. A collaborative study by Xiao-Bing Zhang and his colleagues from Loma Linda University and Jerry L. Pettis from the Memorial VA Medical Center has built on their prior work with genetically modified hematopoietic stem cells (HSCs) that identified a growth factor that caused a 45% increase in bone strength in mouse models. This work was published in the journal Proceedings of the National Academy of Sciences, USA. Zhang and his coworkers wanted to find a gene therapy that promotes bone growth while minimizing side effects. To that end, Zhang’s group focused on a growth factor called PGDFB or “platelet-derived growth factor, subunit B.” The properties of this growth factor make it a promising candidate, since it is already FDA approved for treating bone defects in the jaw and mouth. First, Zhang and others isolated HSCs from the bone marrow of donor mice. HSCs were chosen because they can be given intravenously, after which they will home in to one of the major sites of bone loss (the endosteal bone surface). The isolated HSCs were then genetically engineered to overexpress the growth factor PGDFB. Experimental mice were then irradiated to wipe out their own HSCs, and then these same mice were transplanted with the modified HSCs. After four weeks, the upper leg bones of the mice (femur) were tested. Zhang and his colleagues found that PGDFB promoted new trabecular bone formation, but because the PGDFB was expressed at high levels, it negatively affected bone mineral density. Zhang and others then used weaker promoters to optimize the dosage of PGDFB expression in the HSCs. They discovered that the phosphoglycerate kinase promoter (PGK) worked well to mitigate the amount of PGDFB that is expressed in cells. When these HSCs were transplanted into irradiated mice, they observed increases in trabecular bone volume, thickness, and number as well as increases in connectivity density. Additionally, cortical bone volume increased by 20-30% while cortical porosity was reduced by 40%. Importantly, the lower dosage of PGDFB resulted in no observed decreases in bone mineral density due to osteomalacia or hyperparathyroidism. These treated femurs and a control sample underwent three-point mechanical testing to test the integrity of the new bone. The PGK-PGDFB-treated femur displayed a 45% increase in maximum load-to-failure in the midshaft of the femur and a 46% increase in stiffness, indicating quality bone formation. Thus the new bone that is deposited it also of high quality. The next step in this work would like to determine why this combination of a PGK promotor and PDGFB worked so well. Zhang and others have discovered that PDGFB promotes bone marrow mesenchymal stem cell formation and angiogenesis, which are two important factors in bone growth. They also found that optimizing the dosage of PDGFB is quite important for promoting osteoblast (bone-forming) cell formation. Finally Zhang’s group investigated how osteoclastogenesis, or the creation of cells that reabsorb bone (osteoclasts) is affected by PDGFB with a PGK promotor. The treated femurs also had an increase in biomarkers for osteoclasts. This increase in both osteoblasts and osteoclasts indicates that the treated bones undergo the normal bone rebuilding and remodeling cycle.